fiddlehead focus "sharp, pointed, and modernistic 12-tone pieces for guitar, piano, and violin"
FORT KENT- University of Maine at Fort Kent Professor of Music and Education Scott Brickman will celebrate the digital release of his instrumental music, Winter and Construction, on Tuesday, April 3. The CD version will be released on Ravello Records three weeks later. Brickman has collaborated with members of the Strung Out Trio (Matt Gould – guitar, Beth Schneider – violin, Nathanael May – piano) since 2003. The CD contains seven works that Brickman composed for various combinations of the ensemble. The trio will include Brickman’s 2003 composition, Snowball, during a Midwest concert tour later this month. The trio premiered Snowball in Cyprus, during 2004. The past academic year, Dr. Brickman has premiered three works, Bagatelle sans Tonalite performed by pianist Shiau-Uen Ding in New York City in September 2001, Figureheads (text by Kathleen Ellis) performed by soprano Jenny Greene and pianist David Friend in New York City in November 2011, and Solo Over Changes for piano and digital audio, which Brickman premiered last month at the University of Alabama-Huntsville Festival of New Music. Throughout his musical career and childhood, Professor Brickman gathered influences ranging from the European-American classical tradition of the 2nd Viennese School, to Elvis Costello and The Beatles. 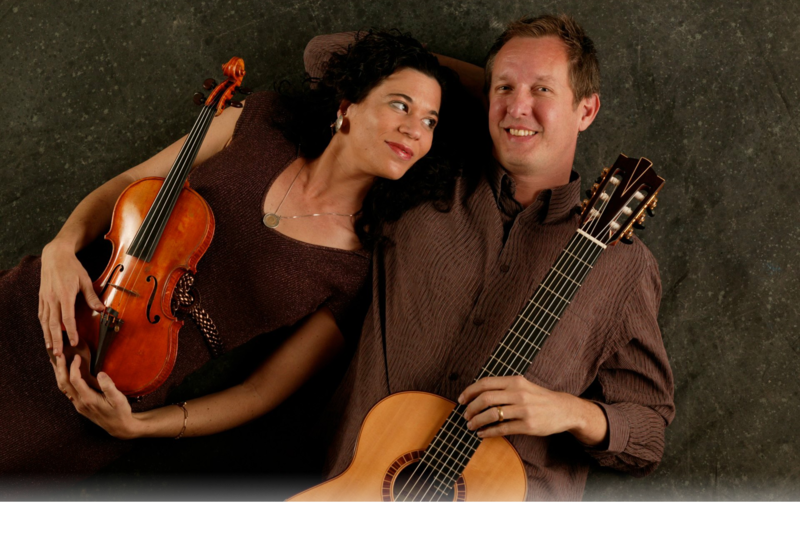 Also, on March 20, DuoSolo will perform on the UMFK campus “Wind Power,” a musical piece by Dr. Brickman. On Winter and Construction, his debut release on Ravello Records, Brickman maintains these disparate influences and brings them together into well-crafted whole to craft sharp, pointed, and modernistic 12-tone pieces for guitar, piano, and violin. Through each piece, he proves his ability to meld the traditional 12-tone procedures of the 2nd Viennese School and the U.S. East Coast with the subjective aspects of his identity as a Midwest-born New Englander. infodad.com "nothing here touches the emotions or appears created for that purpose"
Composers in the 21st century look toward the past in a very different way, and indeed define “past” differently from the way older composers did. Scott Brickman (born 1963), who teaches at the University of Maine at Fort Kent, deems the past to consist as much of the Beatles as of the Second Viennese School, and his works often have the sound of pastiche as a result. They are both modern and modernistic – the former word being descriptive, the latter critical of an approach filled with sudden high notes followed by crashing chords, which is pretty much what listeners who are not fans of modern compositions would expect to hear. The piano sonatas – No. 2 (2006) in four movements and No. 3 (2008) in three – are clear enough in structure and somewhat related to each other, but never seem to go anywhere; nor does it seem they were intended to do so. Winter and Construction (2010) has the fullest sound here, but the three movements of L’Orfeo (2007) are the most interesting on Ravello’s disc, giving guitarist Matt Gould a real workout in movements intended to evoke “Styx,” “Eurydice” and “Morpheus.” The remaining works on the CD – Snowball (2003), Knotty Pines (2008) and Fiddleheads (2010) – are intermittently interesting, with the busy noisiness of Fiddleheads offering more attraction than the others, although this is involvement of an intellectual sort: nothing here touches the emotions or appears created for that purpose. Regular readers won’t be surprised to hear that I am completely ignorant to classical music. As someone who tends to focus on lyrical narratives and compelling writing, classical music leaves me a tad stranded when it comes time to analyze and review what’s going on. Unfortunately for me Winter and Construction is very much classical music, but not in the olde timey sense. University of Maine at Fort Kent Professor Scott Brickman is the album’s composer and plays heavily with abstract arrangements within these pieces. There’s a great deal of pauses, looping melodies and tension created by sudden high notes and booming chords. Many of the pieces feel chaotic and deconstructed, but there’s enough repetition to them that they don’t wander too far off the experimental end. What really makes the record fun are the collaborations. The first thirteen tracks are divided into four suites, and each suite is taken up by a different artist (with the exception of the first and third, which are both played by pianist Nathaneal May). But the tracks “Styx,” “Eurydice” and “Morpheus” are the album’s highlight. Guitarist Matt Gould plays these songs, the album’s most frantic, with a precision that really draws out the minimalism and subtlety of Brickman’s compositions. Those fond for a more “complete” sound will look forward to the last three tracks performed by the Strung Out Trio and Duo 42 ensembles. Scott Brickman is Professor of Music and Education and Chair of the Arts and Humanities Division at the University of Maine at Fort Kent, where he has been teaching since 1997. Originally from Chicago, Scott attended the University of Wisconsin (B.M. in Composition) and Brandeis University (Ph. D. in Music Theory and Composition). He is a member of SEAMUS, SCI where he has served as the co-chair of Region I since 1999, and CMS where he served as treasurer (hint, hint, hint) of the Northeast Chapter from 2001-2005. Scott is primarily active as a composer. His music is recorded on the New Ariel, Capstone, SEAMUS, and ERM labels. Ravello Records, a branch of the Parma label, released a CD of his solo and chamber music, Winter and Construction, in April of 2012. This past year his music saw premieres by the Generous Ensemble (Vary Varied Vexations), Tower Duo (Epic Suite), and Italian pianist Giovanni Sorana took his Toccata – Molto Liberamente on his spring tour of the US. This April, he will have three premieres; violist Ina Litera and pianist Jean Kim will perform his Partita at Manhattan Community College on April 10, Crosslake for violin, clarinet and piano will be introduced by the ensemble Crossisland on April 15, and pianist John Newell will perform Seascape on April 28. Scott is arriving late for this NECMT Conference because he is performing his Solo over changes (2011) for piano and digital audio on April 11, at the SCI Region VI Conference at Clark College in Dubuque, Iowa. Scott’s theoretical interests include pedagogy, 19th Century women composers, and set theory. Since 2002 he has served as an AP Music Reader. He presented a paper on teaching composition through ear training to Kindergarten Students at Michigan State’s New Direction is Music Education Conference. He has presented papers on the music of Fanny Hensel (the subject of the analytic portion of his dissertation) and Clara Schumann at Conferences about Hensel and Robert Schumann at FSU and Texas Tech. Most recently, he presented a power point that describes relationships amongst octatonic sub sets, illustrated by a simple java program, at a SCI Region VI Conference at Central Missouri.